Instead of adding sugar or artificial sweetener to your beverages or food, use SteviaClear Liquid Stevia all-natural dietary supplement. SteviaClear Liquid Stevia contains an intensely sweet extract from Stevia leaves that is 250 to 300 times sweeter than sugar – yet has no calories, carbohydrates nor bitter aftertaste. 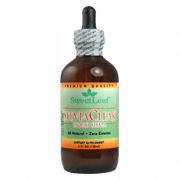 SteviaClear Liquid Stevia is safe for diabetics and hypoglycemics. No alcohol No glycerine Most concentrated liquid on the market! Stevia is an herb useful as an alternative sweetener to sugar or aspartame, is safe for diabetics, and may help regulate blood sugar, balance blood pressure, inhibit the growth of bacteria including that which causes tooth decay and gum disease, reduce cravings, improve digestion and gastrointestinal function, and reduce the desire for tobacco and alcoholic beverages. Steviosides are the sweet glycoside constituents of the stevia leaf. They are 250-300 times sweeter than sugar. Research indicates that Stevioside may be used by both diabetics and hypoglycemics. Stevioside has been approved for sale in the United States only as a dietary supplement. Add to beverages or foods. Try 2-3 drops. Adjust as desired. Stevia Extract (Clear) - is shipped in a discrete, unmarked package. Orders are processed immediately and usually take about 3 to 5 working days to be received. We do ask that you try it for 2 to 3 weeks to feel the full effects. Any information received is used only for order processing and shipping purposes. Your information, such as e-mail address, will never be disclosed to a third party.